Looks ok so far. Make sure the leg goes all the way towards the spine. Don't stop in the middle of the hips. Otherwise just add the other wing and arm and then shade it and you are done. Here is a doodle that is a bit similar in design. It is based on an example in a 'how to draw cartoons' book, so it is not really my creation. The important thing is thighs cover the sides of the hip bones, you won't see that separation half way up. Its pretty good but is he singing? He's standing kinda funny, not very intimidating. Position of feet not very exciting. And its weird how the neck arches then it kinda kinks and bends again from the chest instead of following a general curve. Maybe try sketching in the skeletion first in a few different poses and going up from there. This looks fine to me. Polish up the details and you have a fine dragon. I was not happy with how it was turning out, nor had any idea how to make limbs and scales so made it this way. But as Cyangmou said, this posture looks boring, I'll try to come up with better posture maybe. Take another look at the edit Sohei did for you. 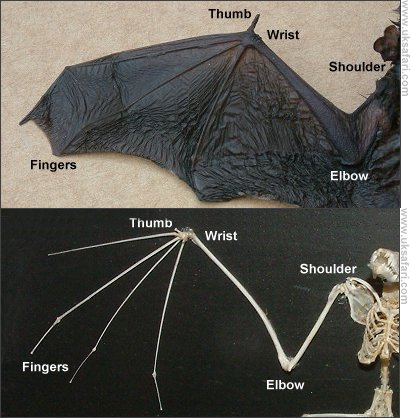 Google for some bat wings and other types. Modify as you please but try to show that the wing is an appendage. Yeah try looking at references of both bats and lizards then just kinda combine them.